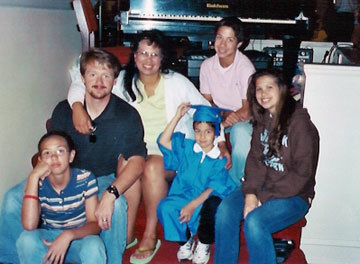 At home in Tennessee, Maria Pack, third from left, is shown with daughter Casey Cox, 13, husband Benjamin, son Tristan, 6, in cap and gown, son Clint Cox, 14, and daughter Candace Cox, 16. Editor's note: In the mid-1960s, Star-Bulletin reporter Helen Altonn wrote a series of articles on adoptions in Hawaii. The series raised awareness of problems here and led to several adoptions. More than 40 years later, a woman who had been one of those adopted babies contacted Altonn, looking for help. Maria Pack says she doesn't want to disrupt anyone's life. She'd just like to know if she has her mother's nose, hair or body build. Pack, of Johnson City, Tenn., was born May 15, 1964, in Aiea and adopted by a military couple at Schofield Barracks in February 1965. She is hoping to find her birth mother but says, "Unless my birth mother or relatives want to meet me, I would just like to know what she looks like." A series of stories in the Star-Bulletin in 1964-65 about the state's difficulties finding homes for racially mixed children led to Pack's adoption by Marie and Larry Parman. Marie Parman said she was four months pregnant when her husband was transferred here in the Army and she had a miscarriage. "My husband and I were reading the paper. It said hard-to-place children were being adopted by military families. I told my husband, 'What do you think?' He said, 'I don't care if it's my blood or not.'" So they went to the Department of Social Services and Housing, now the Department of Human Services, to apply for a child, she said. The adoption decree was effective Feb. 25, 1965, and the couple took home a 9-month-old daughter. "She has never given us a minute of trouble," Parman said. "I thank God, who must have planned it for us. She was a wonderful child." The Parmans also have two biological daughters, Elizabeth and Karyn. Maria was placed in a foster home with a military family when she was born, Parman said. "Her mother was just 16, and her dad was in the Navy at Pearl Harbor. It was just something that happened. They didn't want to keep her." She said Maria's biological grandmother had six children at home besides Maria's mother, and the grandmother and mother decided to put her up for adoption. The Parmans left Hawaii in June 1965 when Larry was transferred to Fort McPherson, Ga., but Marie said she kept in touch with a state social worker for about 12 years. She sent a picture of her adopted daughter, nicknamed "Lei Nai" (lay-nah), every Christmas until the worker died, she said. Parman has joined her daughter in trying to get information about Maria's biological parents. "I would want to know who my real mother was if I had been adopted," Parman said. "I really want her to know. I love her enough and I know she loves me." Pack said she and her mother wrote to the Family Court in Honolulu and the state adoption agency for information but "kept hitting dead ends." Family Court informed Pack by letter in July 2004 that it was unable to send a notice to her biological mother of her request to inspect adoption records. However, the court did say her mother's ancestry was listed as Portuguese, Hawaiian, Chinese, Caucasian, Spanish and Filipino in one part of the file and as Hawaiian, Caucasian and Filipino in another part. Parman said she was told Maria's father was Italian, but the court said his ancestry was not listed. Also, no medical information was available on the birth parents. The court told Pack the only option was to authorize a search agent to locate her natural parents to provide them with a notice of her request. The cost would be about $300 a parent, the court said. Pack instead searched the Internet and hired Florida-based OmniTrace Corp. to try to find her biological parents. The company reported in March it was unable to locate them despite an exhaustive search. OmniTrace investigators said her file showed her birth was May 15, 1964, in Aiea, but the hospital was not known. "We researched the hospitals in Aiea and learned that the only birth-related hospital there was Kapiolani Maternity Hospital that later became Kapiolani Medical Center and remains so today." Kapiolani could not provide any birth information because it maintains records for only about 25 years, OmniTrace said. Pack wrote to the Star-Bulletin for help, enclosing a clipping of one of the stories that led to her adoption in 1965. An educational assistant in a middle school, she said she should have been more interested in her ancestry when she was younger. It was not until a teacher asked her to do a presentation on Hawaii that she began doing research, she said. "I started teaching myself Hawaiian." Pack has three children by a previous marriage, Candace Cox, 16, Clint Cox, 14, and Casey Cox, 13. She and her husband, Benjamin, who develops custom software for Scripps Network, also have one child, Tristan Storm Pack, 6. Pack said she moved around a lot with her family until her father retired from the Army after 22 years. Her adoptive parents are from Greeneville, Tenn., so her family moved close by, she said. She said the kitchen, her youngest daughter's bedroom and two bathrooms have a Hawaiian decor. "She's such a sweet child," she said of her younger daughter. "She said, 'Keep all your stuff (papers) together, and if you don't find your mother and something happens to you, I'll continue.'"